The resources required to address the health challenges facing West Virginians are found at the institutions that have formed the primary partnership for the WVCTSI. West Virginia University; WVU's Health Sciences Center; WVU Medicine; the Charleston Area Medical Center and the CAMC Health Education and Research Institute; the West Virginia School of Osteopathic Medicine; Marshall University; The National Institute for Occupational Safety and Health; and the Department of Veterans Affairs, have come together to build the necessary infrastructure to transform our capacity to do high quality clinical and translational research. With the endorsement by the Department of Health and Human Resources and the West Virginia Higher Education Policy Commission; and with the collaboration of our CTSI strategic partners at the University of Kentucky, we believe that the stated purpose of the WVCTSI will be met. The University of Kentucky also has been the lead in developing the Appalachian Translational Research Network in collaboration with CTSAs at the Ohio State University and University of Cincinnati, and regional academic institutions - and recently the WVCTSI. This network fosters collaborations, joint pilot studies, and develops community-based participatory research programs. The Charleston Area Medical Center Health System (CAMC) is another partner that has been a part of WVCTSI since the beginning. The CAMC Health System was created in 1984 to meet the challenges of providing the highest level of health services to West Virginia. WVCTSI leverages the large network of CAMC hospitals that have a long history of community service dating back to 1895. The CAMC Institute also provides continuing medical education, outreach education, and research support to physicians and allied medical professionals in West Virginia. CAMC Institute also operates schools of cytotechnology and nurse anesthesia as well as the graduate medical, pharmacy, and psychology residency programs jointly directed by the Institute, WVU-Charleston Division and the community hospital track jointly directed by CAMC/WVSOM. With one of the highest percentages of Veterans in the nation, engaging key stakeholders in the Department of Veterans Affairs (VA) is essential to WVCTSI’s mission of addressing the health challenges facing West Virginians. The VA was founded to fulfill Abraham Lincoln’s promise “to care for him who shall have borne the battle, and for his widow, and his orphan,” by providing benefits and services to american veterans and families. Moving forward WVCTSI’s partnership with the VA will allow for training of VA staff to develop impactful research plans and support pilot studies that can lead to additional funding for local research benefitting all West Virginians. Marshall University joined WVCTSI as a strategic partner upon the successful renewal of NIH funding in 2017. Marshall University is one of West Virginia’s first public institutions of higher education and is committed to fulfilling its mission by creating a diverse and inclusive academic community that is sustained in a collegial and nurturing environment of life-long learning. Researchers at MU secure $31 million annually in external funding. As a strategic partner, MU brings an invaluable expertise in genomics, strong focus on addiction research, and the capacity for conducting clinical trials that bring state of the art treatments to people across the state. The National Institute for Occupational Safety and Health (NIOSH), a part of the U.S. Centers for Disease Control and Prevention in the U.S. Department of Health and Human Services, was founded in 1970 to develop new knowledge in the field of occupational safety and health and to transfer this knowledge into practice. Since that time, one of the major NIOSH research facilities has been located in Morgantown, WV. When WVCTSI made chronic lung disease a priority health area, engaging NIOSH became pivotal to the mission of bringing the most impactful research into the Mountain State. Partnering with NIOSH to drive research related to occupational and environmental exposures will allow WVCTSI to expand expertise and provide the most innovative discoveries to the people of West Virginia. 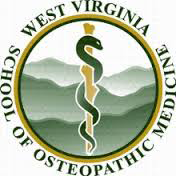 The West Virginia School of Osteopathic Medicine (WVSOM) was established in 1974. The mission of WVSOM is to educate students from diverse backgrounds as lifelong learners in osteopathic medicine and complementary health related programs; to support and develop graduate medical education training; to advance scientific knowledge through academic, clinical and basic science research; and to promote patient-centered, evidence based medicine. WVCTSI leverages WVSOM ’s strong record of engaging communities in the healthcare and research process. WVSOM continues to be ranked number 1 in providing primary care physicians for West Virginia, number 1 in the nation in graduating primary care physicians who practice in rural Appalachia, and number 1 in the nation among all medical schools in graduating physicians who practice in rural areas. WVSOM graduates practice medicine in 48 of West Virginia's 55 counties. West Virginia University has been a WVCTSI partner since the Institute’s inception. Founded in 1867 as a public land-grant institution, WVU is committed to creating a diverse and inclusive culture that advances education, healthcare and prosperity for all. WVU provides access and opportunity to education, advances high-impact research and leads transformation in West Virginia and the world through local, state and global engagement. WVU was named an R1 institution denoting the highest research activity as described by the Carnegie Classification of Institutions of Higher Education. Over 3,000 faculty actively preform research in their respective fields while generating over $127 million annually in sponsored contracts and research grants. WVCTSI currently partners with all WVU campuses across the state as well as WVU medicine.